Applying for an internship can be tough for some especially when it comes to SoP writing. Your statement of purpose (SoP) is maybe the most crucial part of your application and it needs to be written in such a way that it is going to ensure that you are noticed from among the many other applicants that are applying for the same internship as you. Many applicants fail to realize just how much weight is put on a professionally written statement of purpose for internship and stumble with writing their statement perhaps due to their lack of experience or poor writing abilities. The acceptance committee, who will review your entire application package, will be interested to know a lot more about you than just what grades you have achieved. So you have to ensure that your statement is written in a way that is going to really get you noticed, many people find this hard to achieve. Regardless of your reason for not being able to produce a well written SoP, the good news is that there is a solution to this problem and that is by hiring a writing service. How Important Is Your SoP for Internship? If you are looking for a place as an intern you may be asked to write a Statement of Purpose or SoP as part of your application. Often this is the only part of your application in which you are able to give your reasons for wanting to be an intern and why it is that they should accept you. A good SoP for internship applications will be able to clearly sell you and help you to gain that place. However, it can be very difficult to write a SoP that can make you stand out from the other applicants. 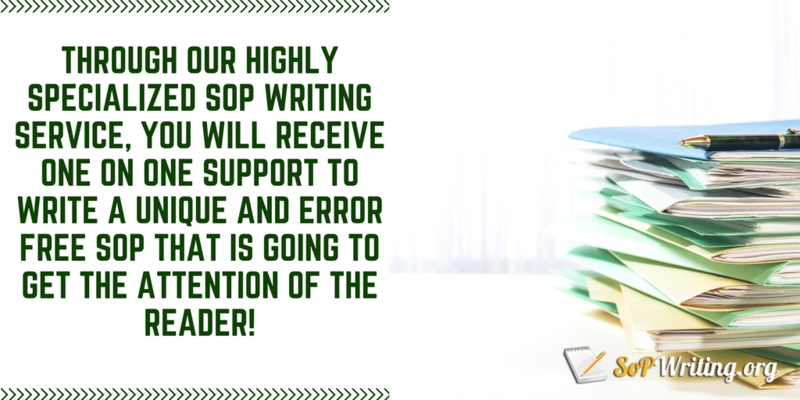 When carrying out any form of SoP writing, you should carefully consider what you are going to write and how it will grab the application committee’s attention to compel them to read to the end. You need to show that you have a serious and well-considered desire for your requested application and that you are likely to thrive and contribute more than any other applicant. Our professional writers have many year’s experiences with the whole internship application process and once they have all the information they require, will then write a uniquely presented internship statement of purpose for you that will make you stand out from all the other applicants. Use a hook, an attention-grabbing opening line that will use a personal anecdote, quotation or fact that is going to make the reader want to read on. Ensure that you have a good reason for wanting to be an intern and that you can show a long-standing interest in the field of the internship. Show how being an intern will fit into your longer-term career plans. Show why it is that you want this specific internship rather than just any other. Demonstrate that you have the skills and qualities that they are looking for. Use clear examples to demonstrate your skills. Avoid the use of clichés; they want to hear about you in your own unique words. Be relevant in what you write, this is about you and your future plans so don’t wander away from this. Don’t repeat anything that you have written anywhere else in your application and don’t make any obvious statements; you will just be wasting your word count. Use language that they can understand, using a thesaurus to find fancy words is not going to help you. Don’t use acronyms or slang either. No matter how good you are at using humor avoid it as not everyone will appreciate it. Stay honest, do not lie or exaggerate within your SoP. Proofread what you have written to ensure that you do not let even the smallest error slip through. If you are thinking of hiring a writing company to work on your statement of purpose accounting or for you should choose one that comes highly recommended by many. You should go for a writing service that offers affordable rates in return for quality output. Fortunately, you don’t have to look far for one because this is what our writing service is all about. We can help you come up with an impressive statement and the best part is that you don’t have to spend most of your budget on us. After all, our rates are among the cheapest in the market. Your statement of purpose internship is best left in the hands of the experts. Our writers are not only equipped with the best writing skills but they also have the knowledge on how to make your SOP for internship or PhD statement of purpose impress the right people. Just send us your order and we’ll make your statement of purpose work for you. Using our statement of purpose writing services has never been easier. By selecting order now, you will be taken to our application form which you will need to fill out as thoroughly as possible. When you have completed the payment details, a fully professional and experienced writer of many years in working with internship application process will be assigned to you. They will then write a draft that you will need to review and ok before presenting you with your finished and unique statement of purpose. Whilst completing the application form on our website, you will be asked to attach any notes or work you may have already written for our writers to use and also to specify your deadline. Our internship application service writers will then contact you directly to find out anything other details that may be relevant to include and help them to finish your sop writing. Once our writer has contacted you and they have all the information they need, they will then start work on writing a draft for you to approve. If you’re not satisfied then any comments or suggestions will be noted for your writer to make another draft. You have an unlimited amount of reviews so that we can get your sop writing to suit your needs. However, if we cannot get it to your needs then you are covered by our 100% full money back guarantee. 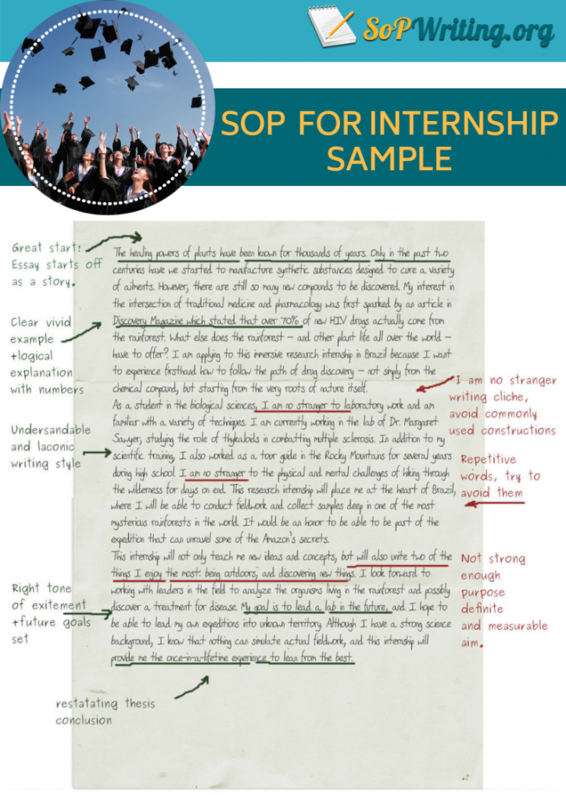 You can also have a look at a sample sop for internship to check our experts’ writing skills. Are very experienced with many years of SoP writing. So if you are looking for help with your SoP, whether you need a doctoral statement of purpose or SoP for an internship, then we have the experts that you need. Ours is a highly specialized SoP writing service that employs only the highest qualified and experienced SoP writers. Through us, you will receive one on one support to write a unique and error free SoP that is going to get the attention of the reader. So if you want an effective statement of purpose for internship applications just contact our experts today! Perfect, thanks a lot Melissa for all your efforts and thanks for calling me and clarifying my doubt. Tomorrow I will submit the application and let you know via text if I come across any problems or questions.